X-ray Diffraction (XRD) is the only analytical technique that can identify compounds by their own unique structure. Use it to solve your technical problems. Discover exactly what your material is made of: Other analytical techniques measure the chemical elements, but XRD reveals the actual identity of the crystalline compounds in your sample. For example, baking soda, sodium acetate or sodium carbonate are indistinguishable by element analysis, but quickly and definitively identified by XRD. Discover what other techniques can't tell you: XRD can identify compounds that can't be detected by ICP, XRF, or EDS, such as nitrates, hydrates, carbonates, and hydroxides. Have a mixture? No problem! XRD can identify multiple compounds in the same sample, and estimate the amount of each type. Is your sample copper sulfate, iron oxide and lead carbonate…. Or copper carbonate, iron sulfate, and lead oxide? Only XRD can tell you. Like a fingerprint analysis, the components in your sample will be matched to their unique signature from the hundreds of thousands of compounds in the standard International Centre for Diffraction Data (ICDD) database. Small sample size? 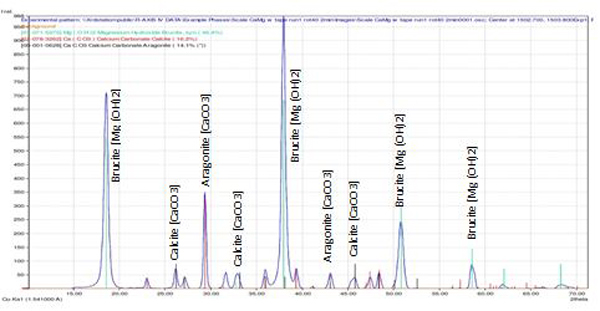 50 mg is plenty of material for analysis, and we can analyze the major compounds in samples as small as 1 mg.
MAI uses a powerful rotating anode X-ray source and a Rigaku two dimensional CCD detector to extract the most information from your sample. Like a fingerprint analysis, the components in your sample will then be matched to their unique signature from the hundreds of thousands of compounds in the International Centre for Diffraction Data (ICDD) database. Below is a typical XRD scan, showing the identification of multiple components in a scale sample. Note the identification of different mineral structures with identical chemistry (calcite and aragonite) which XRD has revealed, providing insight into the formation conditions of the scale. X-Ray Diffraction analysis works by detecting the distance between the rows of atoms in a crystalline structure. High energy X-Rays are reflected off a sample, and are reinforced in intensity at the angles that satisfy a geometric relationship called Braggs Law. A diffraction peak occurs at each of the beam angles satisfying this relationship, and represent one of the atomic row spacings in the crystal (called a d-spacing). The measurement of each d-spacing is so precise that it is measured down to the tenths or even hundredths of an angstrom. The pattern of d-spacing peaks represents an objective fingerprint for each crystal structure, and is unique to that particular compound. The resulting X-Ray Diffraction pattern is evaluated by state-of-the-art pattern searching software and the experienced eye of McCampbell analysts. The result is a report revealing what compound or mixture of compounds account for the total pattern of your sample, and insight into your technical problem.